Jitish Kallat, Sweatopia 1, 2008. 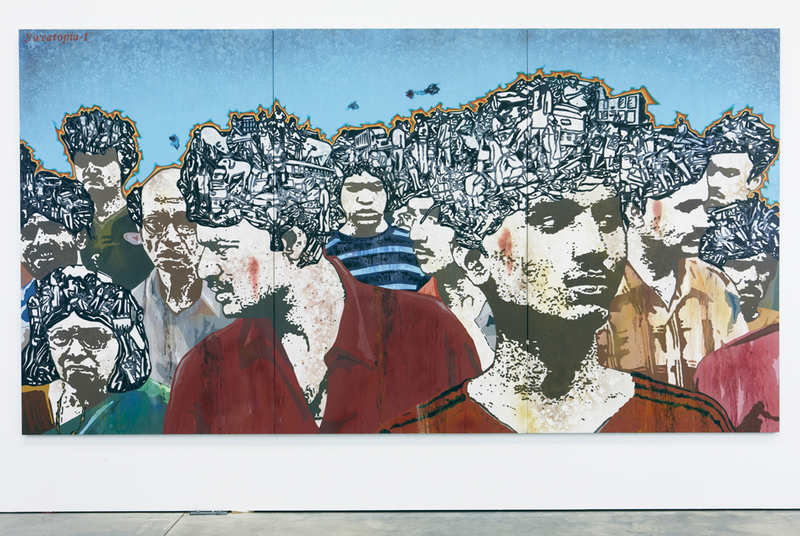 TEL AVIV.- Critical Mass at the Tel Aviv Museum of Art is the first major show to introduce the Israeli public to the thriving contemporary Indian art scene. The exhibition features seventeen artists  both established well-known artists and several young, emerging artists. It takes place in the museum's newly inaugurated and highly celebrated Herta and Paul Amir building. The works included in this exhibition are anchored in a tumultuous social and political reality, and their multiple layers of meaning reflect different responses to the deep transformations that have been taking place in Indian society over the past two decades. These works were created in a wide range of mediums including photography, painting, video, sculpture, and installation. The notions of matter and materiality serves as the principle metaphor for the dynamic, physical and visual experiences of life in the contemporary Indian megalopolis. One of the salient characteristics of the works included in this exhibition is the repetition, accumulation and duplication of densely arrayed images or motifs. This state of multiplicity echoes the visual texture and chaotic expanses of the Indian urban sphere. This overwhelming experience of density, ornamentation, noise, flow, and rich materiality is clearly reflected in the themes, materials, and visual aesthetics of the works featured in this exhibition. These works share a number of central thematic concerns: a dynamic tension between tradition and modernity; accelerated urbanization and development processes and their impact on the environment; a critique of consumer culture and globalization; religious tensions and political conflicts; and gender-related issues. Some of the works tend to consciously deconstruct stereotypes and clichés related to national, regional, gender, or class identity. The preoccupation with these themes addresses, in different ways, the sociopolitical, economic, and technological transformations that have taken place in the subcontinent over the past two decades, and reflects cultural concerns born in the context of a particular time and place. An exhibition of Indian art in Israel holds special interest in a local context, due to the range of affinities between the two countries and to the growing interest of Israelis in India and in Indian culture. The preoccupation with conflicted identities and with a multifaceted social and political reality that is similarly explored in both cultural arenas, serving as a significant catalyst for artistic production. The exhibition is accompanied by a Hebrew-English catalog which includes a curatorial statement and three essays that examine various aspects of Indian culture and aesthetics, while placing them in the context of the major socio-political changes taking place in the sub-continent. Participating artists: Ravi Agarwal, Atul Bhalla, Sakshi Gupta, Shilpa Gupta, Subodh Gupta, Ranbir Kaleka, Rashmi Kaleka, Jitish Kallat, Bharti Kher, Riyas Komu, Raqs Media Collective, T.V. Santhosh, Gigi Scaria, Shanthamani M., Sudarshan Shetty, L.N. Tallur, Lochan Upadhyay.